IOS app development is one of the most promising spheres for mobile app developers around the globe. With the introduction of Swift programming language in 2014, iOS app developers got an alternative to Objective C as Swift supported major iOS development tools. While Swift is a modern iOS app development programming language, Objective-C has its own advantages. Swift is increasingly being adopted by developers across the globe. More than 77.6% of developers prefer Swift over Objective-C for iOS development according to a Stack Overflow Survey. 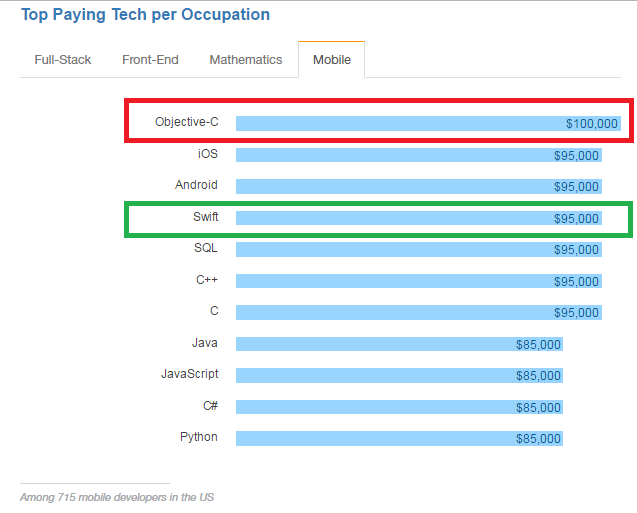 Also, Swift and Objective-C are top paying techs and one should choose a platform understanding its capabilities and features before moving ahead with app development. Objective-C gives a developer the option to craft messages at runtime. It can create classes, add methods to existing classes and change method implementation dynamically, with ease. This gives a programmer better run-time control. Objective-C supports automatic garbage collection and the collector runs automatically in its own thread, simultaneously with application code. Owing to a proven generational model, the efficiency of garbage collection is great. It can target priority memory zones with garbage values, making it easier for a programmer to handle garbage collection. Anyone with a background in C or C++ can start working on Objective-C easily. The object system without complex features such as multiple inheritances, overloading are not present. Though this might seem a limitation, yet this also makes Objective-C ideal for simple programming models that require basic coding with dynamicity. Objective-C supports dynamic typing just like Ruby & Python. This means you do not have to worry about the type of objects that will arise at the run-time. The simplicity of dynamic typing capabilities makes Objective-C a great language for iOS programming. Swift is much simpler to read and comprehend as it resembles the natural English language like other modern programming languages. While in Objective-C the new keywords were differentiated using @ symbol, there are no such spurious symbols to differentiate between type keyword or object-related keyword, making the code easy-to-understand. Swift is simpler when it comes to coding as it removes the requirement of repetitive coding for string manipulation. A programmer can easily add two strings with ‘+’ operator without needing to write lines after lines of code. As Swift is not based on any legacy, it has modern capabilities and features, unlike Objective-C. In Objective-C, a programmer is required to maintain two code files for better build time of executable app. There is no such requirement in Swift as the Xcode and LLVM compiler automatically take care of all this automatically. Swift combines both in a single code file so that you do not have to worry about separating header files from implementation files. Swift can handle memory management in a more efficient way as there is the minimum possibility of memory leaks. As Swift supports Automatic Reference Counting (ARC) across object-oriented code paths as well as procedural path, a programmer does not have to manually take care of memory management while working on low-level API and core graphics API. Swift takes care of memory every time an object is created. Swift and Objective-C are both great programming languages that offer great capabilities to iOS developers. It is not a discussion of the superiority of Swift over Objective-C. Both have their own abilities and shortcomings and developers use both the languages in a syndicate to promise best results to the end-clients.